Hello everyone! 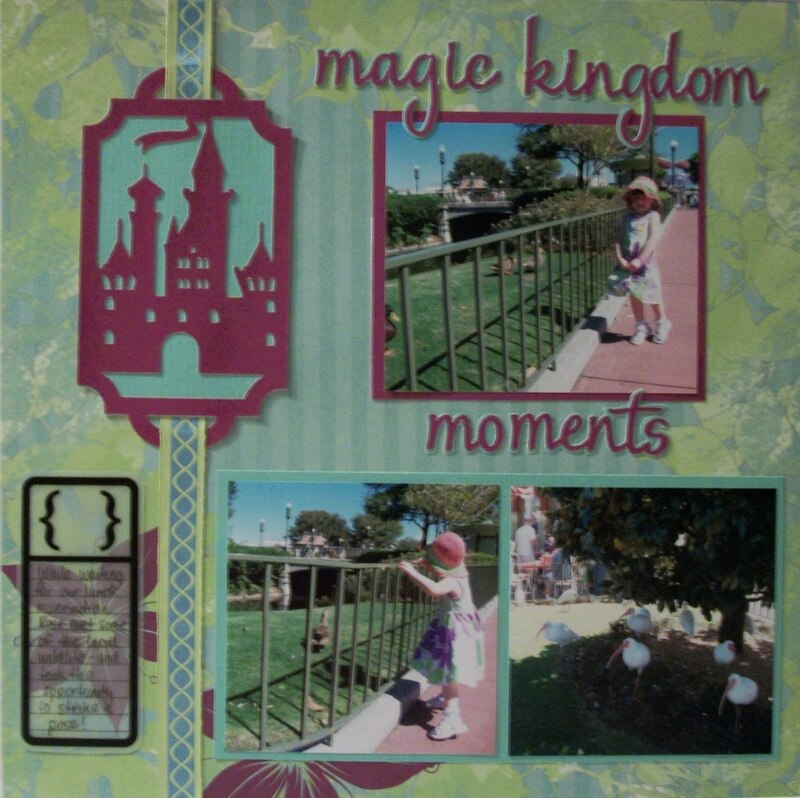 Allison from Goody Bag Diva here to share a layout for my Disney album - these are some pictures of my daughter taking in the wildlife outside of the Crystal Palace at Magic Kingdom. The paper I used is from DCVW Summer Dreams stack and coordinating cardstock - it just went perfectly with the colors in the pictures. I used the font on Designer's Calendar (with the shadow) cut at 1.5 inches and welded together for my title. That particular font is a hidden treasure on that cartridge - I always forget it is there and then am so happy when I remember! 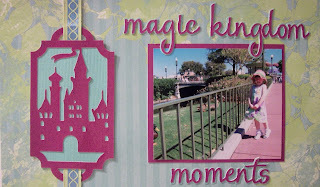 To create my "ribbon slide" I used the Tag Feature for the castle on Wrap it Up - and then I welded it to a plain tag that I rotated 180 degrees. Voila! A ribbon slide. The cut is a little more than 5 inches when it is all together. For the layer behind it, I just welded two of the plain tags together. The whole cut was another treasure I found by using my Gypsy to do a search for castles. The ribbon was a clearance find and the journaling tag is from Maya Road. This was an easy layout to put together once all the welding was done - and I am so pleased with the way it came out. Thanks for looking! Allison, your layout is very pretty and so well laid out. Great job and TFS!!! Beautiful pictures and layout! It reminds me of when out kids were little and we'd take them to Disney. Very nice! Love your slider creation! Allison, you are the official Cricuteer of Walt Disney World! I love it! Your Disney pages have been just awesome!! !